You are officially on the "Road to Cookeville!" Now what!? Here's your playbook to traveling like a champion. Save a seat. Earn cash. The early bird gets the worm, right? Well, at BlueCross Bowl, the early fans get the cash (for their school). Help your school to earn a financial return from TSSAA by purchasing advance tickets, available at your school or via CookevilleChampions.com. Tickets are only $12 per day. Now that your seat is saved, make plans for a full weekend of fun and football. Next up, securing a place to rest your head. Find comfort for sweet championship dreams at one of more than 1,500 hotel rooms plus unique bed & breakfasts. Cookeville makes it easy for Bowl-goers to play Santa, marking off those Christmas to-do lists. Home to locally owned and big box retailers, antiquing & boutiquing, and don’t forget the sportsman & outdoor enthusiast hot spots, you are sure to find something for everyone on your shopping list. *Tip: Be sure to check out The Shoppes at Eagle Point, the new $45M retail development with 250,000 square feet of space on “Restaurant Row” (Interstate Drive). While filling your shopping bags, be sure to fill your belly too! See what’s “Cookin’ in Cookeville” with more than 100 restaurants to choose from, some even boasting fare from world-renowned chefs. Family-friendly breweries and craft coffee roasters round out the tasting experience. In addition to that state champ win, celebrate the season with a Cookeville Christmas. Multiple Christmas Parades throughout Putnam County, depot holiday open houses, and more. And don’t miss joining thousands in downtown Cookeville’s Dogwood Park for the Christmas in the Park kick-off with the official tree-lighting. Have a state-of-the “art” experience. Take in a performance of The Nutcracker at the Cookeville Performing Arts Center, appreciate local talents at the Appalachian Center for Craft gallery, or hear area musicians play at a mom ‘n’ pop restaurant or brewery. Keep up the competitive spirit, even outside Tucker Stadium with activities such as bowling, laser tag or even the Cookeville Escape attraction. You’re already on campus, learn more about what Tennessee Tech University has to offer by booking a tour with the admissions office. TTU has 10,492 students on a 235-acre campus. Tucker Stadium seats 16,500 and has an artificial turf surface. 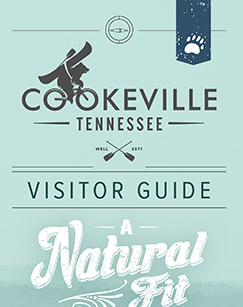 Guests to Cookeville are not asked to leave, but are often encouraged to “take a hike.” Surrounded by 24 state parks & natural areas, you will find countless trails and unmeasurable scenic beauty. What better focal-point for a winter hike than a cascading waterfall? More than 150 documented waterfalls are noted within a 40-mile radius of Tucker Stadium. Cookeville is centrally-located at the intersection of Interstate 40 and Highway 111, just 70 miles east of Nashville. The most direct route to the stadium is to take Exit 286 and follow Willow Avenue for three miles north to the university campus.